Hi everyone, it’s Said from HPE DEV. We are getting settled into 2019, but before we get too far into the new year, I want to quickly reflect on what you and the rest of the community have accomplished. We launched HPE DEV in December 2017, with a small number of advocates that had a passion around our vision: Create a new open-source community where members can develop innovative solutions to complex problems by collaborating with like-minded coders. Since kicking off the HPE DEV program, it has been really cool to see the progress and collaboration the members of the community have made in coming together and participating with us. As an interesting proof point, we started with one community contributor in 2017. During the year we have grown to almost 1,500 community members strong! We have participated in community events all over the world and executed numerous HPE Hackathons (the result of which created several pending patents!). At both HPE Discover events (Las Vegas and Madrid), we experienced enormous amounts of attendee interest, all of whom were very interested in coming to learn more about the deep technical capabilities of HPE’s products, solutions and services. Our 2019 goals are all about expansion into new and different areas of the community so you can help us on how we automate and drive improvement. HPE DEV represents the tip of the spear for these activities and we’ll be collaborating closely with our technology partners like RedHat, Chef, and SaltStack to create more innovative code which we can all benefit. In November, Hewlett Packard Enterprise launched hpe.design at HPE Discover Madrid 2018 under great excitement and fanfare. HPE.Design is a global program that listens to users to better understand their needs and create intuitive solutions that simplify technology. HPE Design encourages people to question conventional methodologies and deliver better business outcomes by infusing design-thinking and encouraging innovation in everything they do. This launch is an important milestone as it marked the efforts of many people. Over the past five years, all of us at HPE.Design have worked to establish a design voice in the organization that puts focus on the customer, the improved experiences we create, and our impact as company in the industry. Though our efforts, I’ve found our greatest strength is building a team that’s skilled, loud, and hungry to conquer any challenge. And we’ve got a great crew (and we’re always looking for new talent) to accomplish these goals! As we continue to transform the whole organization to be more design driven, the HPE.Design team is working on how we solve problems for our customers, and create new and improved products with design experience methodology leading the way. The hpe.design is a key element for sharing tools and resources with the community, and providing views into our process, for both internal and external teams. It’s great platform for HPE and our customers to collaborate -- whether that’s through social media or direct email. And we’re just getting started! hpe.design is not the only initiative we’ve launched. In the coming months, you will see us involved in many industry events and activities across the design community. Please join me as we take the first steps on our next journey at HPE! The HPE DEV blog is a great place to get the latest news and updates from the community, and over the last few months we have had some great articles! Below, find a few of these blogs. Click on the links to read the full articles! “Ephemeral infrastructure as code” refers to compute, storage, and networking that is programmatically assembled, provisioned and configured on demand to suit a variety of workloads. Once each workload execution is complete, resulting output is pushed to permanent storage and the infrastructure is available to be re-assembled and re-provisioned. These “composable” building blocks of compute, storage, and networking resources are available in the flexible workhorse known as HPE Synergy. Today’s pace of technology innovation is staggering. It’s hard to believe, but in October 2008 (over 10 years ago), Amazon Web Services (AWS) made their Elastic Compute Cloud (EC2) available to the public. More recently, we’ve seen the adoption of container-based technologies and platforms such as Docker and Kubernetes. HPE OneSphere can manage VMware vCenter based private cloud in customer datacenter as well as public clouds. After the VMware environment was "onboarded" in HPE OneSphere, VM Templates are surfaced in HPE OneSphere Service Catalog. Once discovered users can consume VMware VM templates directly from OneSphere Service Catalog, and create new deployments. Initially when HPE PowerShell cmdlets (1.x version) were launched it had a limit of 256 thread limit which was good for a certain range of IPs but was not sufficient for a big set of input IP data like more than 10k range. Then we re-designed the default thread limit to 64 in iLO and BIOS modules which received good feedback initially but later few customers reported that its slow performance when a big range of data is provided. In December 2018, the HPE DEV team attended KubeCon 2018 in Seattle, Washington. The event, which is Cloud Native Computing Foundation’s flagship conference, gathers technologists from leading open source and cloud native communities for four days, to further the education and advancement of cloud native computing. The event was a great success and event attendees were excited to see what HPE DEV brought to the show. 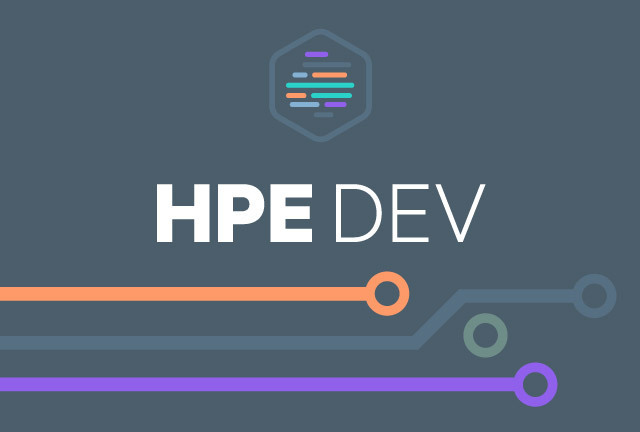 At HPE DEV, we are excited for an event-filled 2019. Coming up, we will be attending the HPE Technology and Solutions Summit (TSS) in Paris from March 11th through 15th. TSS is Hewlett Packard Enterprise’s once a year, largest and most comprehensive technical and solutions knowledge transfer event for European, Middle East and African Presales Consultants, and Solutions Architects from both HPE and partner communities. HPE DEV will be on-hand at TSS to create a collaborative place where people can come together to learn about new concepts and technology, and then apply that knowledge with hands on practical application in a fun and informative way. At the event, HPE DEV will host another HPE Hack Shack for you to interact with HPE’s new open source community advocates. Here, you will learn how HPE developers are supporting a broader developer community to create innovative solutions to complex problems by collaborating with like-minded coders. This developer community provides a clear understanding of how HPE is enabling thousands of developers to co-develop solutions using open source software, DevOps, and ITOps tools. Most importantly, the Hack Shack is the place to come to hang out, talk code, and anything else tech related. But before you challenge yourself at one of the Hack Shack sessions, sharpen up you knowledge by attending a Technology Workshop. These workshop are very interactive, so come armed with your laptop and be prepared to get some hands-on training. In addition to the Hack Shack and the Technology Workshops, HPE will also offer Design Workshops at the event. These workshops will enable you to improve upon how to best run a brainstorming session and how to best explore your next big idea. We invite you to join these workshops to learn new ways of collaborating in an extremely engaging and informative way. Stay tuned for details on upcoming HPE DEV events, such as Google Cloud Conference, KubeCon Barcelona, HPE Discover Las Vegas, and more!